Levi Weaver is an American singer and songwriter. 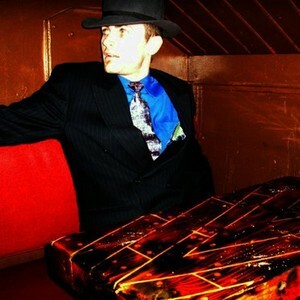 Born in Colorado and raised in Dallas, Texas, Weaver moved to Birmingham, England in 2005 after his former band (coincidentally named "Stories Of London") broke up. He released his first EP, the self-recorded "Civil War Between My Heart and Mind," in April 2006. This EP has since been licensed to Respect Music, a publishing company in England. It's never been the normal way for Levi Weaver. It's never been the normal way for Levi Weaver. Forget for a moment that his dad was a professional rodeo cowboy and a missionary. Set aside that he moved to England for two years just... because. And let's move past the fact that at one point, he was studying to be a baseball play-by-play announcer. Even when he finally settled on a career, it's still been anything but normal for Levi. "Oh, there's no way I can ever give career advice. I got my big break by winning a MySpace contest. I mean, c'mon." Weaver says with a wry grin. That "Big Break" started as a support slot for Imogen Heap on the Birmingham stop of her 2006 UK tour, but very quickly became something more when the Grammy Nominee asked Levi to join her on her entire North American tour. Since then, abnormal has continued to be the norm. After releasing his debut LP, the 2008 release "You Are Never Close To Home, You Are Never Far From Home" Weaver logged about 30,000 miles playing mostly house shows... in a 1993 Honda Accord. Now, Weaver is back with another offering, "The Letters of Dr. Kurt G?del". "This one is even more personal, actually" says Weaver. "I set out to write and record an experimental country album (that will happen someday, by the way), but instead this... THIS came out in the demos, and I realized I was accidentally telling my life story." So why is it titled after a WWII-era scientist? "G?del's a pretty crazy character," Levi explains, "this guy was the first to suggest that Einstein's theory of relativity allowed room for time travel, and his theorem - 'the Incompleteness Theorem is..." he pauses, "...okay, this is so weird, but to me, it's like it mathematically explains what it means to be human. Does that make any sense? No? I don't know." The method in which the album is being released is also a step away from the traditional. He's selling tiered-price packages before the album has even been recorded. As the funds come in, he is releasing one song per month for a year, before releasing the full album in September of 2010. "Yeah, some people are impatient with the one song-a-month thing," he says. "but it's like - look: it's going to take me a year to finish this album anyway. So if you want to wait until September 2010 to hear the whole thing at once, you still can, but just know that the rest of us are going to be listening to it, in essence, as it is made." The idea seems to be getting the right response - Grammy Award-Winning Producer Mitch Dane (Jars of Clay) signed on at the end of the summer to co-produce the album. "Yeah, when he told me he wanted to work with me, I was awestruck. Just like ... wow... a real producer... that's so weird."